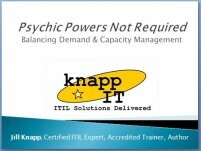 ITIL V2 « Knapp I.T. Time is running out for the Manager Bridge! If you already hold an ITIL V2 Service Manager certification and would like the shortest path to a V3 ITIL Expert, then the Manager Bridge class is for you. The classes will not be offered for much longer, so you need to act soon! APMG has scheduled the official retirement date of this class as June 30, 2011. . . .
→ Click to Read More of this Post: Time is running out for the Manager Bridge! Recently I considered refinancing my mortgage. With interest rates being so low these days, I could easily knock 2.5 percentage points off my mortgage if I refinanced. I called my mortgage company and asked for information, and I was connected to a mortgage loan sales guy. He was the only human I had ever spoken with at my mortgage . . .
Upcoming Service Desk Webcast – Free! On Wednesday, August 11th from 3 – 4pm Eastern Time, I’ll be participating in a BrightTalk Summit revolving around Service Desk optimization. I’m giving a free presentation called “From Helpless Desk to Service Desk: 10 Tips for Transformation” and I hope you’ll attend! You can watch it right here from my site (below), or if you don’t see an . . .
→ Click to Read More of this Post: Upcoming Service Desk Webcast – Free!